We're happy to offer our readers the chance to attend a free advance screening of The Man Who Knew Infinity, starring Dev Patel and Jeremy Irons. 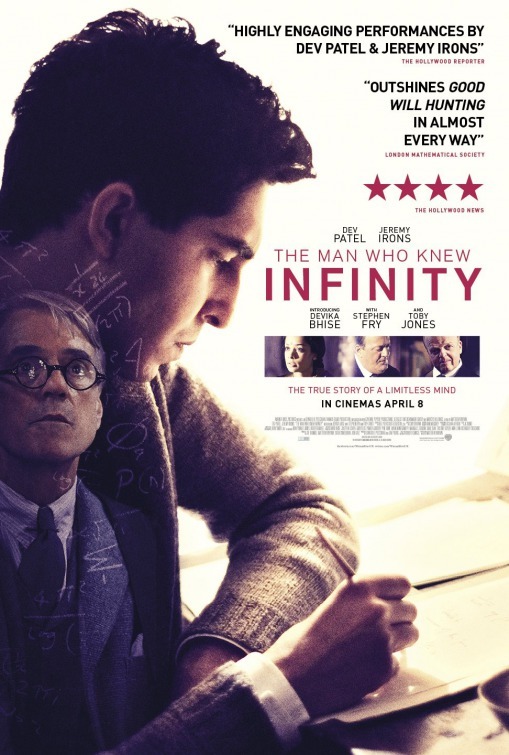 Directed by Matthew Brown, the film tells the true story of self-taught genius Srinavasa Ramanujan who obsessively pursued his passion for mathematics despite rejection and derision from his peers With the help of prominent mathematics professor G.H. Hardy, he leaves his home in India for Cambridge so that his brilliant theories can be further explored. The screening takes place on Wednesday, May 4th at 7:00pm at Landmark E Street Cinema. If you'd like to attend, simply download and print the below E-Pass, good for you and one guest. Please remember that having passes does not guarantee entry and you'll want to arrive early to ensure receiving a seat. Enjoy the show! 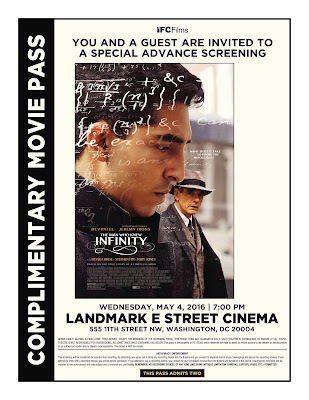 The Man Who Knew Infinity opens May 6th.